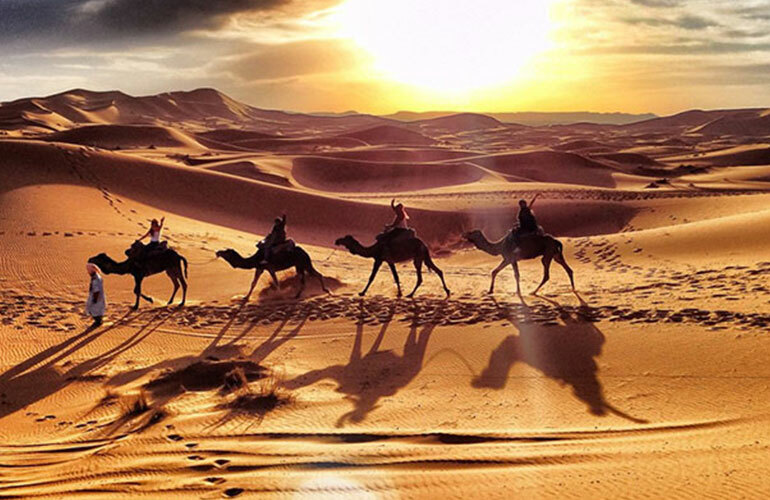 Over the years, our 3 days desert tour from Marrakech has become extremely popular, perhaps because this trip provides the opportunity to discover and learn about the real deal: the Morocco Sahara Desert with its stunning oases, its unbelievable sand dunes, it’s Kasbah and its rocky deserts. And that’s not all! 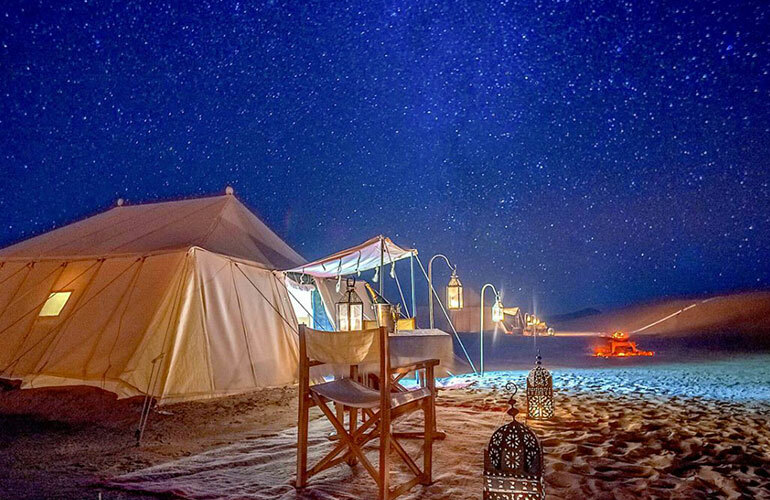 You’ll enjoy camel trekking in the sand dunes and an overnight sleepover in our private Sahara Desert camp, nestled in a hideaway somewhere in the sand dunes. We’ll visit the Berber village of Ait Ben Haddou, renowned for providing the backdrop for the famous HBO series Game of Thrones and also serving as the location for many blockbuster movies, like Gladiator. Towards the end of our trip, we’ll visit a Kasbah and Atlas Film Studios, located in the city of Ouarzazate. 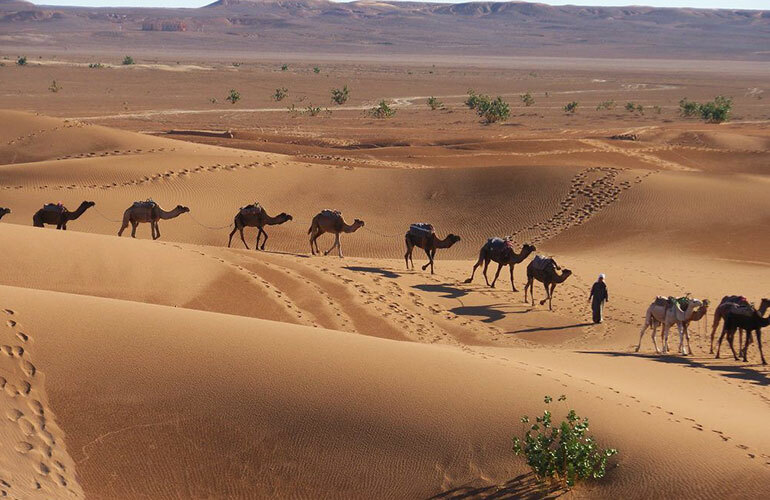 This Private 3 days desert tour from Marrakech of a lifetime from Marrakesh to Merzouga will start in the early hours of the morning. We’ll leave Marrakesh at 7:30 am and travel via Tizi-n-Tichka Pass through the High Atlas Mountains. So, stopping along the way becomes a necessity. We know you’ll be fascinated by the UNESCO World Heritage Kasbah Ait Ben Haddow, the scene of many Hollywood blockbuster movies, and we’ll visit Kasbah Taourirt, then carry on to Ourzazate. We’ll continue on through the Valley of Roses to Boumalne Dades, and arrive at our boutique guest house in Dade’s Valley. You’ll have an enjoyable evening meal and comfortable overnight accommodation, prior to departing for day two of our desert tour. First, you’ll have a delicious breakfast and subsequently, continue on with our journey to Tinghir. Via the 1001 Kasbah road. Here, you’ll enjoy a leisurely stroll along the bank of the Todgha River. We’ll call into Berber villages and Ksours, and complete our trek admiring the magnificent cliffs of Todgha Gorge. After a leisurely lunch in the gorge, we’ll head off to Merzouga. At Erg Chebbi we’ll meet with our camel caravan where the road ends. 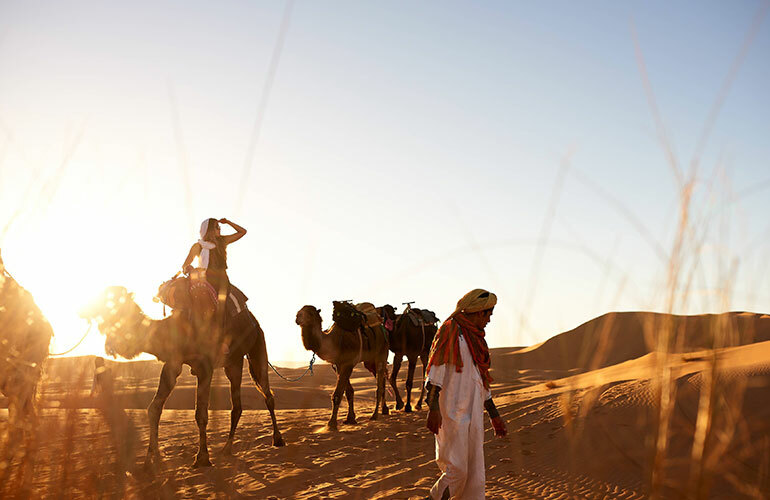 You will begin your camel trek over the sand dunes. And experience what we believe to be a soul cleansing experience. We’ll then return to our Sahara Desert camp to rest. 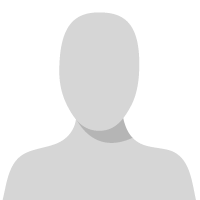 Moreover, you’ll dine as guests, as opposed to clients. 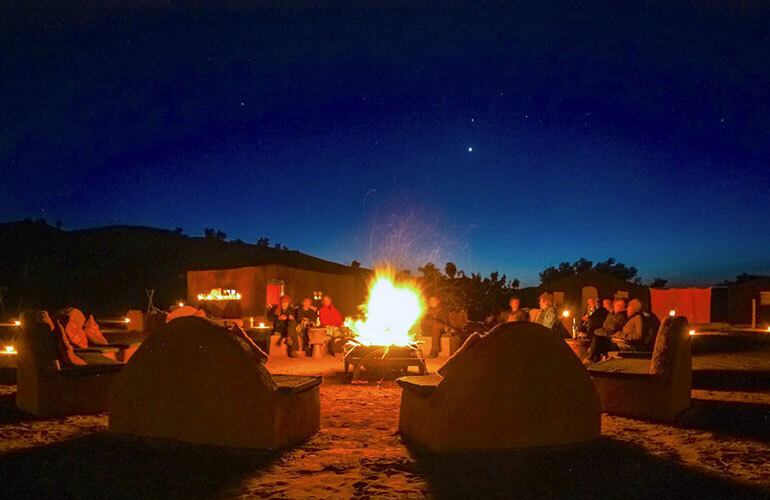 In addition, Your Moroccan dinner will be served next to the campfire while local nomads entertain you with the music of their drums. Shooting stars and a crystal-clear constellation will complete a picture-perfect day. 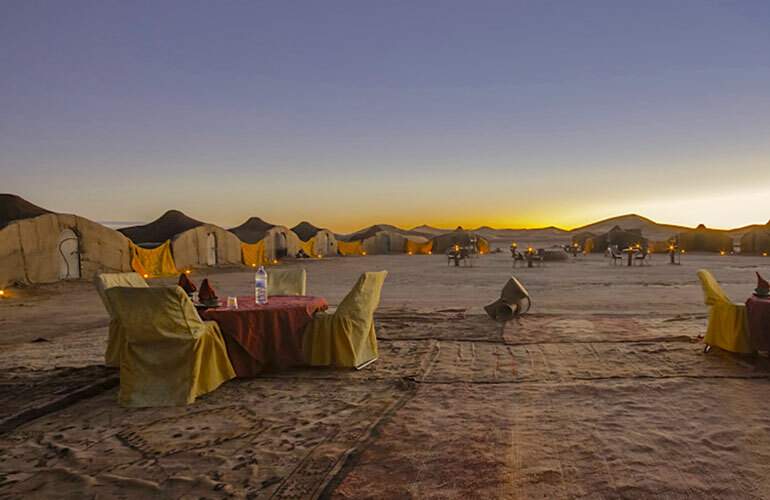 You’ll enjoy a comfortable overnight stay at our secluded Sahara Desert camp, and start planning for day three of our Sahara Desert tour. On our return trip to Marrakesh, we’ll travel via Dade’s Valley in Ouarzazate where we’ll enjoy a leisurely lunch. After that, you will continue with your tour. Before going back to Marrakesh, and because you’re with us, you will have another chance to admire the gorgeous Tizi-n-Tichka Pass. 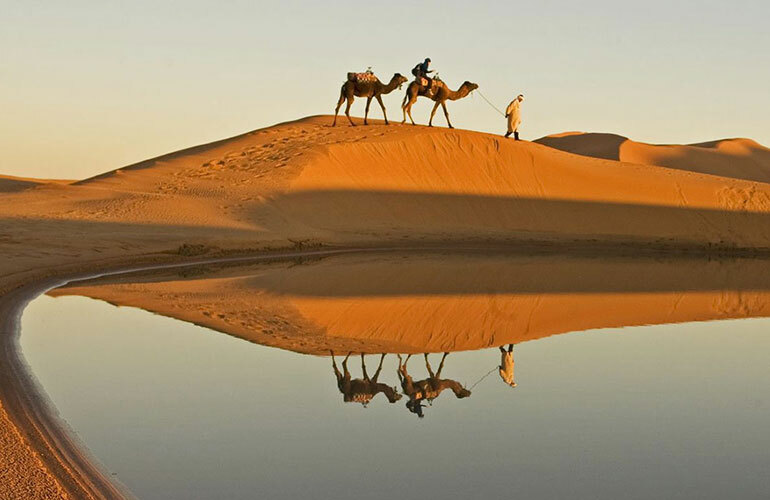 Finally, Your 3-day desert tour from Marrakesh to Merzouga will be over after your driver takes you to your hotel or riad. On the completion of your tour, your driver will drop you off at your riad or Marrakesh hotel, or alternatively at the closest accessible location.